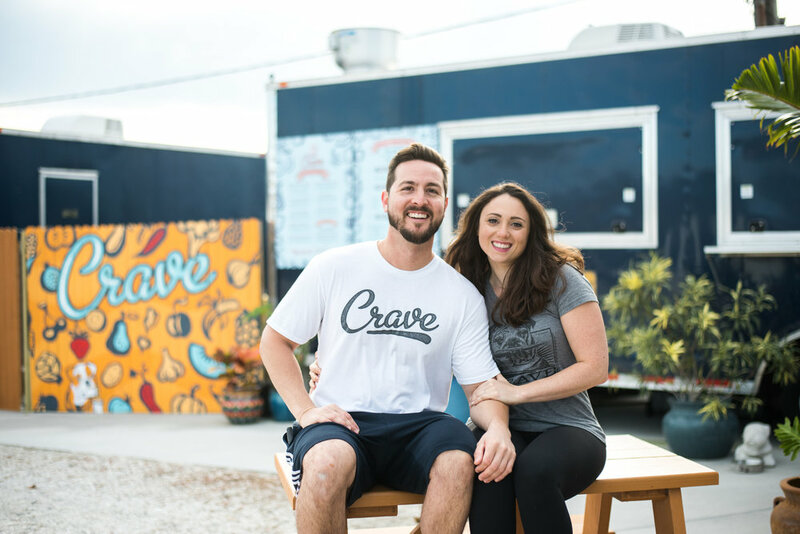 Owners Andreas Guardiola and Renee Spadaro are health enthusiasts and food lovers and their passion comes through strongly at their fabulous blue food truck, CRAVE. Opened in July of 2013 at 134 Riberia in St Augustine, CRAVE now has a second location at 647 A1A Beach Blvd, attached to Kookaburra. This duo is recognizing their dream of offering alternative, healthy food and they have developed a loyal following of both tourists and locals in a short time. Sourcing as much local sustainable produce and indigenous product as they can, this food truck is dishing out innovative wraps, sammies and salads to satisfy your daily crave! In season greens come from Ben Well’s farm in Hastings and Versaggis Farm in Elkton. Local shrimp is carried from The Seafood Shoppes down the road to the food truck. Organic Tempeh is made by Jose’s in Gainesville. All humus is cooked daily from scratch, a time- consuming process. And all these goodies come with top class service and attitude! You can easily visit their Facebook page to tempt your palate, the photo collection is amazing and displays not only the fabulous foods, but their strong sense of service and community.